As St. Patrick’s Day approaches, people around the globe start thinking of cooking some traditional Irish fare as part of the celebrations. 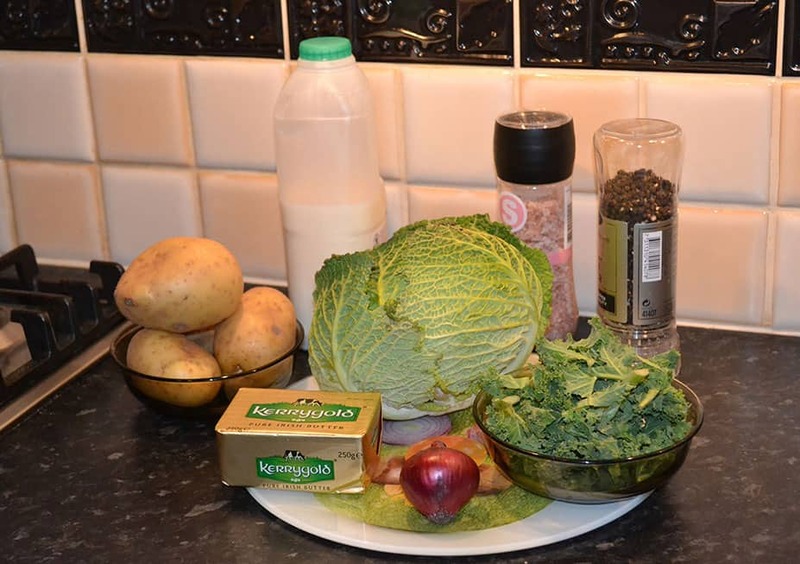 There are plenty of delicious options available, but arguably none of them is more tasty, satisfying and redolent of the Emerald Isle than Colcannon (cál ceannann in Gaelic).So we have the original and traditional Colcannon recipe for you today. This miracle of kitchen alchemy turns the humble mashed potato and cabbage or kale into a culinary tour de force. In this short piece, we look at the history of this most Irish of dishes. Mashed potato and green vegetables such as cabbage and kale have, of course, long been staple parts of the Northern European diet. They are filling and nutritious and, when supplemented with some form of protein, were ideal for labourers who had worked a long hard day but had relatively few resources for more luxurious fare. 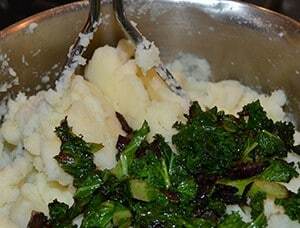 There’s no real consensus among food historians on when Colcannon, that felicitous blend of potatoes and greens enriched with a little milk and butter, first appeared on tables and became a star in the firmament of Irish traditional food, but there are references to the dish dating back as far as 1735. It’s even the subject of a song. Like the pictures in a dream? Which you mother used to make? Another delightful tradition was that any unmarried woman would put the first and last bites of the Halloween cál ceannann into a stocking and hang it from her front door. The next single man to enter the house by that door was said to be her future husband. An Irish traditional food of the masses, Colcannon is now something of a gourmet delight, and all sorts of twists are added to the classic mashed potato and cabbage or kale combination. You will see food writers suggesting the inclusion of lardons, pieces of Gruyère cheese and even tiny flakes of chilli. Nowadays, it also isn’t uncommon to see cooks frying the dish in a little oil to crisp it up like English “bubble and squeak” or baking it in the oven. These variations can be controversial, though. Food writer Nigel Slater said of the modern interpretations that people should feel free to depart from the Irish traditional food with its mashed potato and cabbage or kale, but they shouldn’t call the resulting dish Colcannon. Potatoes peeled, chopped and ready for boiling in salted water. With the Colcannon recipe ingredients gathered, the first step is to prepare the potatoes. Peel and quarter them depending upon how large they are. 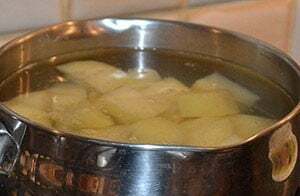 Place the potatoes in a large pot and cover them with cold water, bringing the water to an inch above the potatoes. Add a level teaspoon of salt. Bring to a boil and then reduce the heat and simmer for approximately 15 minutes until the potatoes are cooked. Check with a fork if you are unsure. When ready, drain the water off and leave covered. 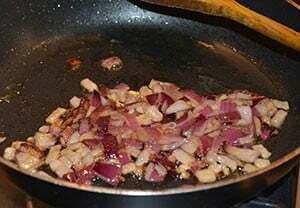 Finely chopped onions being sautéd. Whilst the potatoes are being boiled, finely chop the onions or scallions and also clean and finely chop the kale removing any tough or thick-looking stalks. Melt about 1 tablespoon full of butter in a large pan, add the onions and saute for about 2 minutes. Add the kale to the onions and cook for another 3 to 4 minutes until it wilts. 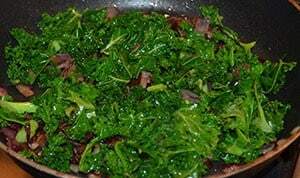 The kale and onions in the frying pan. If using cabbage, it is best to boil it first in order to make it tender for mixing with the mashed potato. 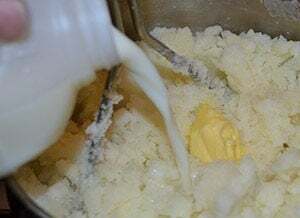 Milk and butter being mixed into the mashed potatoes. Now back to the potatoes. Mash them adding 3 tablespoons of butter and the milk. If you think the mash is too dry just add some more milk until it is at the consistency you require. Kale and onion being mixed into the mashed potato. Add the kale and onion mixture to the mash and mix them thoroughly together with a potato masher. Season with salt and freshly crushed black pepper to taste. Place the Colcannon into a suitable serving bowl and it is ready to serve. 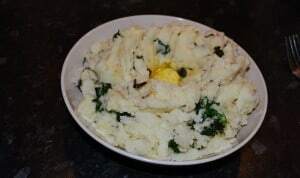 To serve Colcannon, make a well in the center and add the last tablespoon of butter. As this butter melts it will add to the delicious flavours of this traditional Irish dish.